First Minister’s pledge to boost the economy: Small is beautiful! Let’s get some cycle routes. “We in GoBike, campaigning for good cycle infrastructure in Glasgow and surrounding areas were pleased to hear that the First Minister proposes a cash boost to the economy following the EU vote result. We would be delighted, though, if the opportunity could be taken to improve our transport infrastructure, not only for the big projects, but by looking at the detail and smaller projects. While we recognise that dualling the A9, improving the A83 and strengthening our rail network are vital in many ways, we know only too well that the Scottish Government and our Local Authorities will not achieve their target (or is it now just an aspiration?) 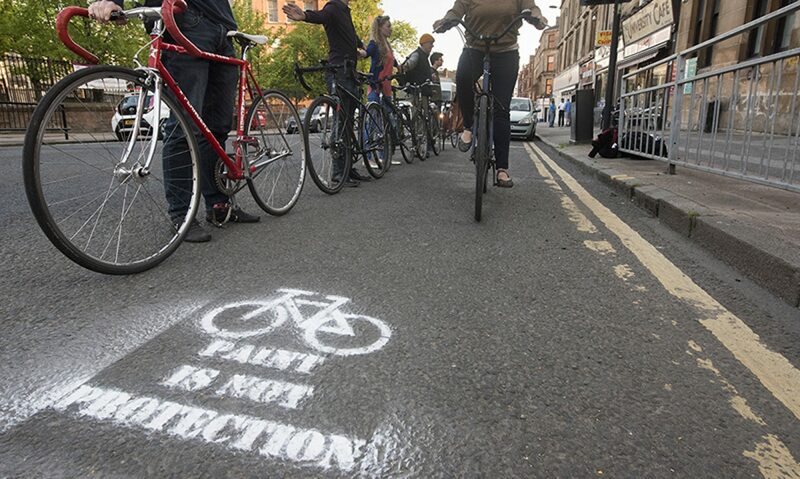 of 10% of all journeys being by bike by 2020. The opportunity should now be taken with any transport projects that are brought forward to enhance the walking and cycling experience. Ensuring good pedestrian and cycle facilities, ie dropped kerbs, cycle and walking lanes with every road scheme. Installing good signage to walking and cycling routes. Ensuring that all major roads have cycle lanes. Ensuring that all cycle lanes have good lighting. The opportunity should also be taken to bring forward the schemes currently with Sustrans under the Community Links and Community Links Plus, and those other cycling schemes that our local authorities are hoping to get budget funding for. Give a boost to Local Authorities. Encourage the use of local labour, rather than the big multi-national construction companies, thus allowing more apprentices etc to be employed and trained. Help the Government reach its active travel target. Get more of the population walking and cycling. Reduce car use in our towns and cities, thus reducing pollution. Improve the general health of the population and thus reduce our use of the NHS. Enhance the environment in our towns, cities and rural areas. Give the people of Scotland a sense of well-being.